Shakespeare had it right when he asked, “What’s in a name?”. He could have had Chennai in mind then. As people, we are not easily perturbed by inconsistencies in our names. Chennai, Madras…what’s in a name? We use the one that comes off our tongues at that moment without a second thought. As to how the city came to get these names, there is no dearth of stories. From Chennappa Naik, Chennakeshava Perumal, Mada Raja, Madre de dios, the Madeiros family, a madrassa… the list is endless. So which of these really contributed to the city’s name? Your guess is as good as mine. Amidst all the brouhaha about reclaiming the original pre-colonial names, we sometimes confuse which came first, or which was less colonial in origin. In this case, it does seem very plausible that it was the name Madraspatnam. Chennai is a city that has been home to many peoples from many lands. And several roads and locality names are reminiscent of its colonial roots. Elliot’s Beach, Georgetown, Mowbray’s Road, Montieth Roa- Today many of these are called by different names, and some of them are so long that even fitting them into one signboard is a challenge. Henry Chamier came to India as a civil servant and rose to the position of a member of the Madras Council, and he had a road named in his honour. The road is now called Pasumpon Muthuramalingathevar Salai. Thevar, the leader of the Forward Bloc party in Tamil Nadu, was a passionate follower of Subash Chandra Bose, and would be quite surprised to find his name gracing a road here. Another interesting story is that of Cenotaph Road. With a name like that you would expect to find a cenotaph – a memorial for a dead person whose remains are elsewhere. You can walk up and down that busy road and not find a trace of any cenotaph simply because there isn’t one. However, there was one, a beautiful structure with a domed top, dedicated to Lord Cornwallis. Both cupola and statue were dismantled and shifted – the cupola to the Fort area, where it can be still found close to the entrance, and the statue to stand in solitary splendour under the staircase in the Fort Museum. Before being brought to this place, the statue was moved around from pillar to post, and one can only hope that this gentleman has finally found peace, even if it is in a stairwell. The ‘Old names for new’ is an exercise happening everywhere, often prone to political influences. A more recent exercise was the ‘remove caste names’ fad. All long names suddenly got shortened. Kutty Pillai street became Kutti street (no reflection on the length of the road), Linga Street and Thambu street lost their “chetty” suffix, and so on. West Mambalam now has two Balakrishnan Streets and a lot of confusion. Earlier, it had a Balakrishna Naicken Street and a Balakrishna Mudali Street, and no confusion about both. Ah well, you gain some and you lose some. And then there is the sonorous Thadandar Nagar in Saidapet, reminding one of a noisy thunder storm. How chagrined was I when I came to know that the original name was Tod Hunter Nagar! Then again, not all street names revolve around names of people. There is Avadi, an acronym for Armoured Vehicles and Ammunition Depot of India. Mylapore owes its origins to the story of Goddess Parvathi being cursed by Lord Shiva to be born in these parts as a peacock (Myil in Tamil). The beautiful Poovirundhavalli (translated as: the place where flowers bloomed) mutated to Poonamallee, and remains so till date. 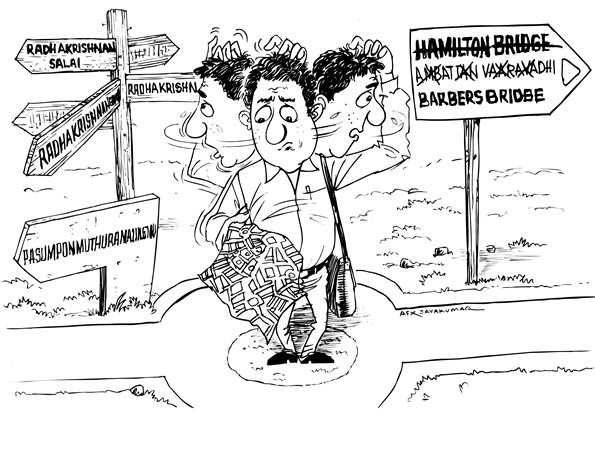 An essentially English name which was shorn of its beauty and cut real short is Hamilton Bridge which some how became Ambattan Vaaravadhi, and got translated (literally) again as Barber’s Bridge. Well, at least no one has started applying numerology to street names (yet). Imagine an Annnna Salai or a Raajaajii Road ! Till then, let’s hold on to the old and use the new judiciously, and hope that too much of Chennai history will not be erased with this desire to change names. And Shakespeare is still right for he went on to say that a rose by any name would smell as sweet, and Chennai will always be Chennai, whatever be the nomenclature.